STASIS is a London / Glasgow based dance collective consisting of Aniela Piasecka, Isabel Palmstierna, Olivia Norris and Paloma Proudfoot. Their work explores, with an ethical imperative, contemporary femininity. The feminine subject’s social dysfunction is considered, embodied by the performances’ qualities of fracture and disconnect. The group was born out of a common desire to probe the intricacies of gender identity through performance. They make work for galleries, clubs, theatres, film and outdoor spaces and are drawn to transforming ‘non-performative’ spaces into temporary stages, exploring their meaning and, by extension, opening up a dialogue between the performers, the space, and the audience. At Mimosa House, they will present their newly commissioned work Cherry lips, Crystal skies. 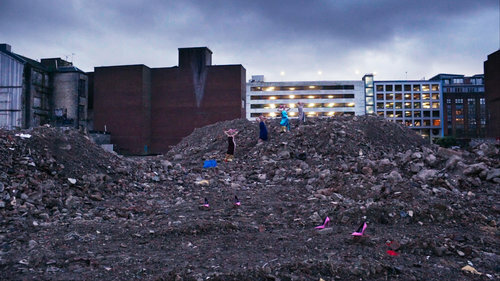 STASIS dance and performance works were recently shown at BALTIC39 in Newcastle, in collaboration with Marvin Gaye Chetwynd’s MEGA HAMMER as part of DRAF’s night of performances at KOKO, London, and at Glasgow International 2018.